I didn’t know they were in season, man. In “Rambo II” and “Cobra“, George Pan Cosmatos directed two Sylvester Stallone films which could hardly be more 80s; these movies stand as two of the more memorable examples from that decade’s glut of violent action cinema. Cosmatos died in 2005, but with “Mandy” his son Panos revisits the era of his father’s greatest successes (that said, many consider 1993’s “Tombstone” to be his finest hour or two). “Mandy” is set, quite specifically, in 1983 – a year in which much heavy metal still had a relatively threatening edge before being eclipsed by the silly excesses of hair metal. Cosmatos Jr.’s film, somewhat surprisingly, opens with the sounds of King Crimson – not a metal act as such, but one whose prog stylings certainly influenced many a concept album (metal and otherwise) of the 80s and beyond. 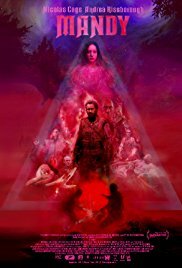 And “Mandy“, with its simplistic story, overblown treatment and intricate, fantasy artwork-inspired tableaux, plays very much like a metal concept album. Nicolas Cage‘s Red lives a quiet country existence with Mandy (Andrea Riseborough); the two are clearly besotted with each other, but their idyll is shattered when they’re captured by order of Linus Roache‘s cult leader. Mandy is the one they really want, but she refuses to play the cult’s game and therefore meets a horrific fate, which the despairing, helpless Red is forced to watch. The buildup to this is slow and deliberate, but after roughly one hour Cage – and the film – fizzes to life as Red sloshes a bottle of booze over his wounds and down his neck, all the while letting out a series of feral yells. His plaintive cries have virtually nothing to do with his physical pain, but rather are all he can do in the face of a horror he can never unsee. The scene is as disturbing as it is riveting, and it pretty much serves to demarcate the film’s two very different halves. The second half, as you will probably have guessed, sees Red exact bloody, brutal revenge. Nicolas Cage, as we all know, is a truly great and fearless performer, and in “Mandy” he gives as committed a performance as you’ll see this year. In the film’s first half, he has very little to say or do, and he patiently sits on the sidelines until his moment comes; these early passages are largely dominated by British actors Andrea Riseborough and Linus Roache, and, good as these two are, you can’t help but find yourself marking time before the beast in Cage in unleashed. A third British actor, Richard Brake, also appears, inviting comparisons with Rob Zombie’s not entirely dissimilar films; Brake’s memorable turn was the best thing about Zombie’s most recent feature, the sloppy “31“. Mandy’s story may be nothing new, but Cosmatos is just as big a star of the film as Cage; he directs with such confidence as he creates this nightmarish, color-saturated world (running these two mighty close, however, is late Icelandic composer Johann Johannsson, whose score is a perfect fit for the unnerving, hallucinatory imagery). Refreshingly, the director hasn’t just set out to make a wink-wink 80s sendup; all too often, filmmakers can’t help but ridicule the cheesier aspects of the decade, but there’s a sincerity to Cosmatos’ vision, albeit one which doesn’t come at the expense of humor. Before watching the film, I half expected something approximating a mirror of the video game “Far Cry 3: Blood Dragon” – a ridiculously fun, tongue-in-cheek pastiche of 80s action movie tropes (featuring the voice of Michael Biehn, no less) – but happily both the director and his cast harbor somewhat loftier ambitions. Cosmatos can even throw in a cameo from Bill Duke, known to so many for his roles in the 1980s smashes “Commando” and “Predator“, without any risk of overplaying his hand. It’s quite tough to convey just what it is about “Mandy” which gets under the skin. It’s certainly not a film for everyone, and at just over two hours it may prove off-putting as it initially looks as if it’s the sort of thing that should run for a scant 80 mins or so. Some will inevitably walk out, but make it to the end and it won’t be long before you’re itching to experience this one again. I’m proud to present this first guest blog written by Darren Arnold. Darren is a freelance film critic, originally from Scotland and now based just outside of London, where he lives with his family. He has been a film reviewer for the past 28 years, and over a year ago he started a project focusing on Dutch & Belgian cinema. He contacted me to start up a co-op in which we could exchange reviews. Naturally I welcomed this opportunity.